While utilizing automation best practices, a major consulting company automated a repeated process in order to save time on manual labor—always a smart decision. However, they weren’t happy with the speed of the automated workflow. The company was using web browser interactivity to search for a certain type of product on Amazon, grab a list of the top 10 products, and loop through each item on the list to find the product’s name, price, image, and more. The whole process took six minutes. Robotic process automation at the user interface level is one of the most popular and useful tools out there. But it's not the only way to build effective automation. The Automate team helped the consulting company automate the Amazon process using an API call to grab the html of the results list and parse it, taking the entire process down to less than 20 seconds. Robotic process automation is valuable to businesses because of its ability to execute an entire process exactly the way a human would do it—interacting with websites, clicking buttons, or opening windows. But as-is automation isn’t the best choice for every workflow. And with the right automation platform, setting up backend automation isn't any more technically demanding or time-consuming than using RPA. For many processes, handing over each step that a human performs to a software robot is the most efficient option. If the process is low-volume and not business-critical; for example, something running on a single user’s desktop, you can easily streamline the workflow by automating it as-is. If you're automating workflows that are project-based rather than ongoing, investing in optimizing the process might not give you the best ROI. The major benefit of the as-is approach to automation is simply that you can have your automated process up and running quickly. We especially recommend as-is automation for Proof of Concepts. This automation style will help you demonstrate that automating the process is feasible, and you can worry about optimization when the process is in production, or when it scales. Even though as-is automation lets you configure robots in a hurry, you should still take the time to do some groundwork. Talk to the people in your organization who understand the process best to fully document every task in the workflow. Don’t forget to include any alternate paths—for example, what happens if the file you need never arrives? Once you have the process fully mapped out, you should be able to automate each step in just a few minutes. Plus, having this documentation will help if you choose to optimize the process down the road. GUI automation is simple, but it’s not the most reliable or the speediest method of automating. If you have a process that involves multiple people and is fairly high-frequency, you should consider optimizing your automated workflows. This can be done when you first automate, or down the road as a second phase. With this approach to your workflow, you might end up with a combination of GUI and backend automation. Go through the process steps that you have documented and make note of where you can automate via the backend; for example, with APIs and web services. You’ll find that this method improves the stability of the process and the speed of execution. It also tends to provide more robust error handling, auditing, and security. While optimization takes a bit of extra work, the move from as-is to optimized automation is not a huge burden if you have the right automation tools, and you don’t have to be a programmer to increase the speed and reliability of your process. Sometimes a process deserves not just the optimization of certain steps, but a full revision of the workflow. Usually these processes are high-volume, mission-critical, or require especially rapid execution. To rework the process, you can leverage an established process improvement methodology such as Lean Management or Six Sigma, to review the process, identify areas of inefficiency, and map a new workflow. Your design may or may not require adjustments based on your automation capabilities. Out of the three approaches to automation, this one takes the longest to develop. But for a critical, high-frequency process, it can also lead to the greatest gains in ROI. The first step is to identify a list of processes that could be automated. To determine priorities, analyze each one using a weighted matrix like a Six Sigma C&E. Inputs can include factors like criticality to the business, the impact of potential human errors, and the effort it would take to automate. This exercise will help you arrange your priorities as well as organizing information that can help you decide whether the process is worth a quick configuration of RPA or a total reworking of the process to maximize ROI. 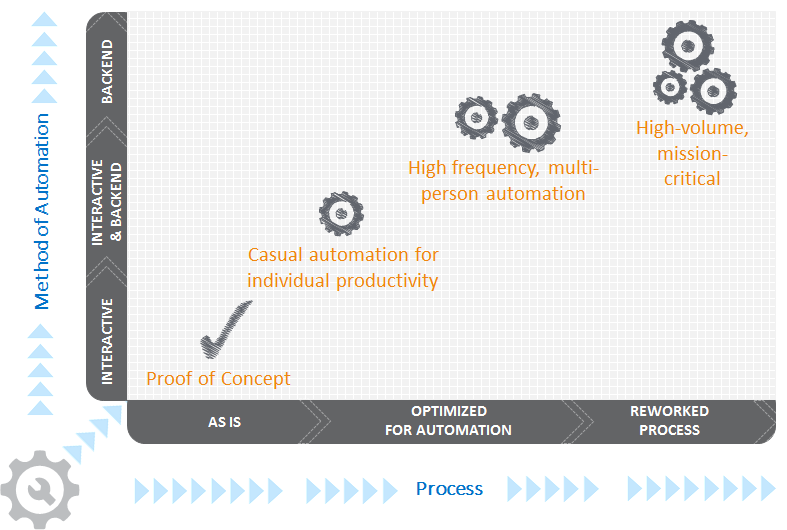 The ideal approach to automation is different for each of your organization’s processes. Consequently, you’re likely to end up with a blend of automation types—some will be fully automated by robotic process automation, others will use backend automation, and still others will involve a combination of solutions. It’s important to be able to move between types; for example, if a simple desktop process scales to include more machines and users. This is difficult to achieve if you’re using disparate automation tools that don’t work together. For seamless automation across your organization, look for a solution that can provide easily configurable software robots, but also go beyond RPA with backend automation and advanced capabilities. The Automate product suite provides solutions for the entire automation spectrum. Consult with an RPA expert and find out how to best meet your organization's unique challenges.